Iran has recently been the epicentre of the deadliest quake of 2017. Over 530 Iranians died, along with 7 people over the border in Iraq. But read Western media coverage of the recent quake and one has the impression that Iran’s elected leaders needed to be informed what an earthquake even is. The New York Times’ good old Thomas “Positive News From Iran is an Oxymoron” Erdbrink implied that the government does not care for its fellow citizens, and that they only initiated a relief effort because of domestic media attention. Or Western media tries to imply that only the general public was responding. Or they run Netanyahu’s promise of aid because it allows him to publicly call Iran a “tyrannical regime” yet again. Of course Iran turned the offer down, as Netanyahu knew they would – it’s from the blood, sweat and tears of Palestinians. Iraq also rejected the offer for the same reason. But I can personally bear witness that there is a reason why countries actually come visit Iran to learn how to handle earthquake relief. As I extensively detailed in this column, Iran follows it’s own model which I call “Iranian Islamic Socialism”: it has allowed Iran to create a number of modern socio-political solutions – like with earthquake relief/prevention – which other countries can take advantage of. All that is needed is to check your Western-fomented biases at the door. In 2009 I published an article called “Bam – 5 Years After”, which was an on-the-ground investigative piece. It was a progress report on the reconstruction effort that was necessitated by the 2003 earthquake in the small city of Bam, which killed some 30,000 people and wounded 20,000 others. Obviously the death toll was an immense tragedy and the entire area was almost totally levelled. But Bam is also a bit special because it contains Bam Citadel – the world’s oldest adobe structure and the finest monument of a fortified medieval town (well, it was prior to the quake). It is a testament to humanity’s collective feudal past, and a reminder of just how very far we 99% have come. So I visited Bam in 2009, got unprecedented access, wrote a great article, and you can find that article – and all the glorious pictures – below this little preamble here. And when I say it was a “great article” it is absolutely NOT because of anything I did: it’s a “great article” because what you will read should make you feel good. Bamis suffered an inordinate, hellish amount, but at least their small city has been rebuilt into a modern, earthquake-resistant, thriving magnet town. In 2009 I had no affiliation to Press TV, media in Iran, or the government: I can assure you that if the situation was poor I was 100% prepared to report it as such. So even though many will forever ignore my reporting and all of Press TV’s reporting as “propaganda” (while swallowing whatever BBC, NPR or PBS says without thinking) there is absolutely, positively no way I can be accused of bias in this 2009 report. Looking back, I’m shocked I got so much access so easily? After all, I was only a (temporarily) unemployed freelance journalist, and about to board a plane to relocate to Paris. So the fact that I got an interview with the Minister of Housing says a lot: it shows the openness of the Iranian government to interested journalists; it also shows how probably few requests Iranian officials get from journalists who are not planning to write in Farsi; and it also shows how obviously confident the government was that my article would be a positive one. They even arranged for the Deputy of Reconstruction to give me a guided tour for two whole days, so “unprecedented access” was not an exaggeration. I also talked with widows, passersby on Bam streets, charity organisers and many others. My article posted the good and the bad – you’ll likely agree that the 2009 article is about a 90-10 split in favour of “good” results. Certainly, these two regions are different in size by orders of magnitude, but in 2008 there was still constant complaining in the US of the mishandling of FEMA Director Michael “Good job Brownie” Brown and George W. “Doesn’t care about Black people” Bush. Frankly, I think may other countries would have just given up and left Bam to become a ghost town. It’s buildings were around 70% destroyed and 90% damaged – at least 1/3rd of the city’s population had been killed. The government could have easily just thrown some money at the survivors and given them a one-way bus ticket to another city, in a case of forced relocation. But that would have been terribly unjust and undemocratic, and not at all the Iranian Islamic Socialism we are used to. Or the government could have done the bare minimum, in a de facto way to depopulate the city. But that would have been immoral. What did I document that the Iranian government did instead? They “did not let a crisis go to waste” in a hugely socialist, democratic and religiously moral fashion; they defied the easy solutions which are offered by capitalism, executive-branch dictates and immoral irresponsibility. The political ethos of the reconstruction is apparent in a quote you can read below from the Housing Minster: “…the biggest issue we tried to resolve was getting the people as involved and as empowered as possible.” This ethos – personal empowerment via decentralisation of power from a tiny cabal – is the political goal of socialism, of course. Well…I don’t know what else you can ask for regarding proof of Iran’s socialism? 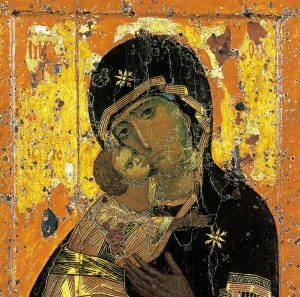 You just have to get over your totally-unshared insistence that Marxism and religion cannot mix – they can and do, and not only in Iran but in Catholic/Santeria Cuba, neo-Confucian China and elsewhere. I’m sure the deputy humbly meant: Iran has been lucky enough to avoid a “humanitarian intervention” like Somalia. Looking back, I’m very glad I took so many pictures: the charges of bias are so nonsensically ingrained, both among anti-Iranians and anti-Iranian-Iranians (LOL), that they really help me refrain from needing to defend myself from charges of “lying”. I addressed this audience with an article in 2006, which was a sort of “Bam – 3 Years After”. I did not visit Bam, but I did interview Dr. Abolhassan Astaneh, structural engineering professor, principal investigator in the collapse of the World Trade Center for the National Science Foundation, and someone who was personally involved in the reconstruction of Bam. 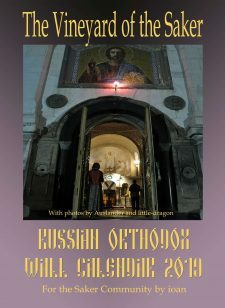 That article predates the internet era, but I thought he had some fascinating insights which you may like to read because they apply to all countries. So in case you have a natural disaster in your country – God forbid – you may do well to keep Dr. Astaneh’s comments in mind. ‘It’s very normal for people to demonstrate after a disaster, when the whole thing is in chaos and the stench of thousands of bodies is in your nose. People who are not familiar with these ground zero disaster scenes don’t understand that, and they might blow such a thing out of proportion,’ said Professor Astaneh. And Professor Astaneh’s opinions echo the patient, pragmatic tone sounded by most experienced disaster workers. It must be accepted as an unfortunate reality that when disaster strikes, help can virtually never arrive promptly enough. Complaints over aid delivery seem to perpetually follow in the wake of natural disasters, despite everyone’s best efforts and intentions. Other than the U.N., whose powers are limited and often resented or rejected, there is no multinational governing body to regulate and coordinate these disparate but altruistic elements. Another unfortunate fact that can cause aid to dry up is that the world’s attention is easily, understandably and often necessarily diverted. Exactly one year after Bam’s earthquake the Sumatra-Andaman Earthquake, or Asian Tsunami, struck the Pacific Rim and would prove to be the ninth-deadliest natural disaster in recorded history as over 230,000 people were declared dead or missing. But when disaster strikes the responsibility ultimately falls upon that nation’s government, as they are the most capable of swiftly responding to the needs of its people. Recent studies revealed that it takes the European Union and other major donors – organizations which one would think have the most efficient logistics capabilities – nearly 11 months from the time they receive an emergency request for food until the starving nation receives it. Many countries did in fact send relief aid, but not $800 million worth. 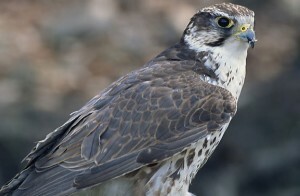 And as far as $800 million in cash – Professor Astaneh said that widely bandied figure was never delivered. If it (cash) does not arrive in the first year, said Professor Astaneh, in his experience it does not arrive at all. The world’s humanitarian organizations provided Iran with a great deal of aid, but the world’s governments appear to have failed Iran’s needy. Professor Astaneh visited the Kashmiri earthquake relief effort in Pakistan in 2005 and he cites that government’s actions as an example of how a disaster reconstruction should not operate. He said Pakistan was initially very interested in the reconstruction model the Iranian government eventually designed for Bam, which operates under the idea that government must deliberately work alongside the people and guide them in the long process required for intelligent rebuilding. But in the end, Pakistan hastily gave cash directly to the people and let them make their own spending choices. ‘They did not take the time to create an infrastructure to help people make the best choices, as they did Iran,’ said Professor Astaneh. ‘They had more money donated to them than Iran, but instead of going thru the pain of putting in a system to ensure people get safe houses they just gave money (about $6K for each family) to quiet everybody up. In the end, some people used it to get married, to pay for hajj (pilgrimage to Mecca) – they did not do all the things they needed to do like go buy the right concrete, get the right architects; they ended up wasting their money,’ said Professor Astaneh. Professor Astaneh has visited many disaster sites and been extensively involved in documenting and researching many reconstruction projects, and not all of them successes. He believes Bam’s housing reconstruction has been a triumph because of the government’s purposeful planning and not succumbing to pressures for a quick fix. 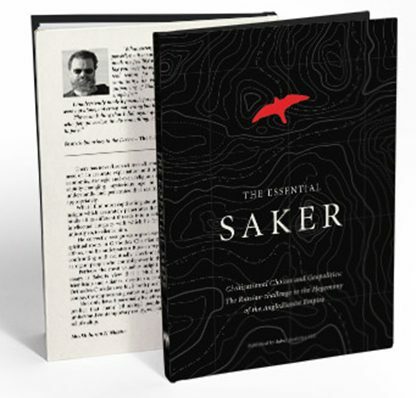 Professor Astaneh credits Housing Minister Saeedikia for the idea that the government should treat Bamis as clients and not simply as desperate victims. The government’s role was to act as the middleman and financier while the dispossessed were the customers. The result was the government supplied the money and the framework for reconstruction and intentionally left the final decisions on design, architecture, furnishings, the choice of contractor and much else to their clients. At some point in reading this (if you are not Muslim) – you probably thought: “This is all quite in accordance with socialist ideas”. So what is Bam like today? I can’t say – for some forgotten and totally inadequate reason I foolishly did not return in 2013 to do “Bam – 10 years after”. However, check back next year for “Bam – 15 years after”, Inshallah. But I’m sure it will be impressive, and the city should be finished by now. All of Bam’s statistics have been fully published on the internet. how many houses were destroyed, how many houses were cleared, how many foundations were laid, etc. The reconstructions has been published as well. All of the cash received from foreign governments has been published as well: Spain gave $5 million, which was earmarked for carpets. (If you think that’s too much, you really don’t know Iran!) But it’s all there – this is not an autocracy – civil servants are held accountable and want to keep their jobs/get re-elected, after all. I would assume that all charities have declared themselves how much aid they gave: $47 million from the International Red Cross and Red Crescent alone, which was by far the largest donator and the most involved in the reconstruction. 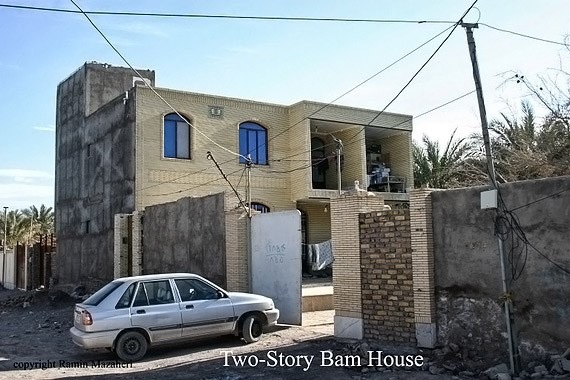 Both foreign and charity aid obviously compose a small, but appreciated, minority of the $1.5 billion the Iranian government has detailed it has spent on rebuilding Bam. That is even more than the $1 billion the World Bank predicted in 2004 it would take. The earthquake actually created an influx of people into Bam because they knew the government was coming to the rescue – these “carpetbaggers” were actually a main source of disputes, as my 2009 article relates. Regardless – just check the pictures: all that new stuff means money was spent, value was realized, mismanagement was minimal. Case closed. Still don’t believe me?! Then please go visit Bam, that’s the best way to help them. 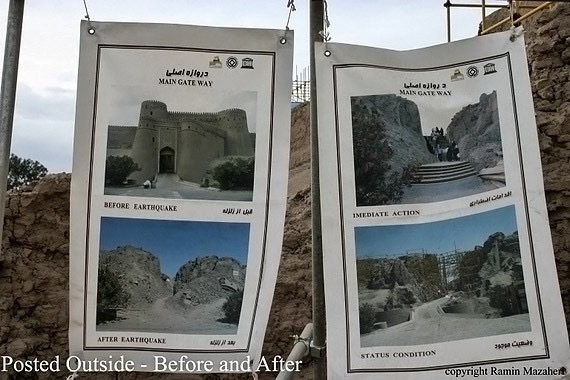 Bam used to get 100,000 tourists per year, and the Citadel is supposed to be fully reconstructed (with earthquake resistant-but-nostalgic materials) by 2020. But this article, and especially the in-depth one below, should give hope to those struck by the most recent earthquake. If there is “mistrust of the government”, it has not been caused by the one popularly pushed into power in 1979. “This mistrust of the government goes back 2,500 years,” said the Housing Minister in 2009. And as it should – Persia was a feudal monarchy, and it was rank tyranny. Bourgeois (West European) democracy may have pushed rule by the 1% to rule by the so-called “talented tenth”, but in 200 years they have only expanded by one percent to “nepotism’s ninth”, but certainly no further than that and even if that. What Iran has of 1979 is a People-centered popular democracy which is obviously hugely influenced by socialism and religion – the reconstruction of Bam is yet another proof of this. I doubt many will believe me so, again, I’m glad I included pictures. 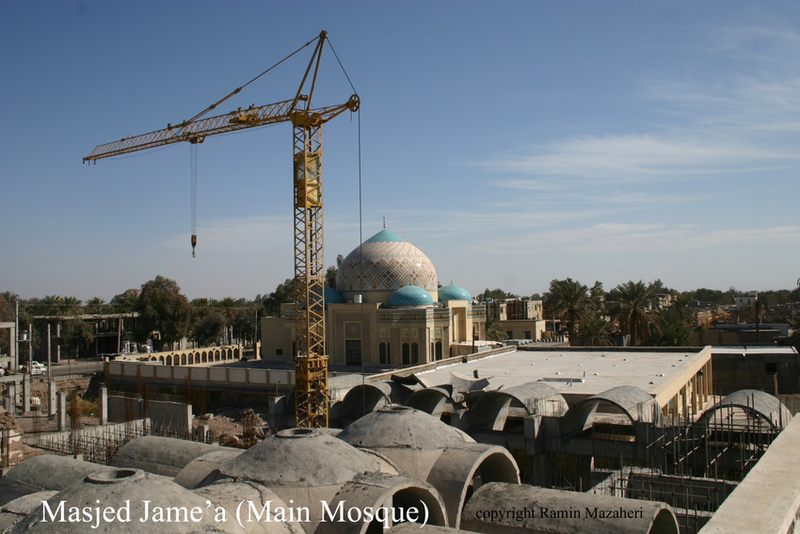 I invite you to please enjoy this article below from 2009, which details the reconstruction of Bam, Iran. Payvand.com – Arash Arjmand and his family made the day’s drive from Shiraz to wonder what this room with no roof and no door might have been. The family sidestepped mound after mound of ruined terracotta as they toured the ghost fortress of Bam Citadel, just five years ago a 25-century-old monument but now merely ruins. 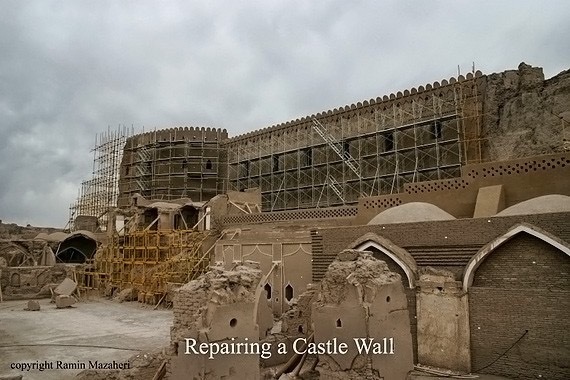 At the UNESCO World Heritage Site in the ancient Silk Road city of Bam, Iran, engineers from around the world are attempting to piece together what used to stand as the world’s largest adobe structure and best example of a fortified medieval walled city. On December 26, 2003, an earthquake killed 32,000 people, flattened 70% of Bam’s buildings and equally devastated the nearby town of Baravat and 260 area villages. 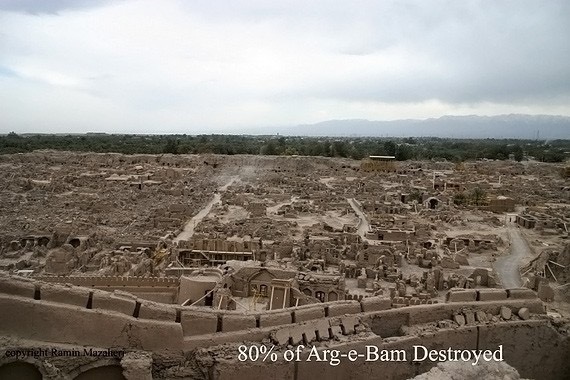 Bam Citadel (or Arg-e-Bam) was reduced from a stunning byzantine garrison, visited by more than 100,000 people yearly, to a canyon of pulverized rubble not much different than the other treeless, rock-strewn mountains that delineate the central Iranian plateau from the southern desert. “I don’t know what it was, but it must have been something,” said Mr. Arjmand, whose face beamed with patriotic pride as he began talking not of this exemplar of Iran’s storied past, but of the public school across the street remarkably constructed of glossy yellow granite and regal marble. 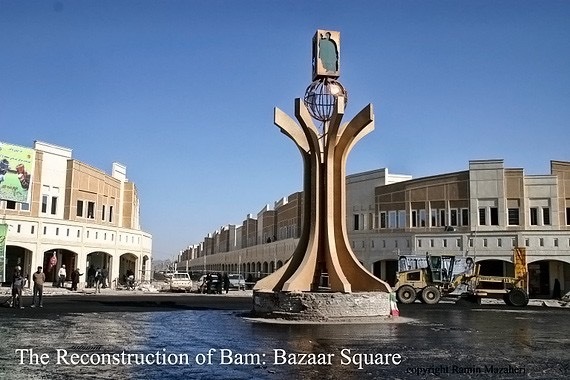 “Bam is 80% what it used to be,” gauges Mr. Mohammad Saeedi-Kia, Iran’s Minister of Housing and Urban Development. This seems to be a fair assessment: Startling signs of progress routinely emerge amid half-completed homes and countless piles of debris. But 80% of a modern city may prove to be better than 100% of the rickety town that fell. Bam’s picturesque but archaic mud-brick buildings were the primary instrument of the quake’s carnage. When these buildings collapsed they didn’t leave the voids and air pockets that emerge when modern concrete buildings crumble, claiming more than a quarter of Bam’s population. Foreign governments immediately promised more than $800 million in humanitarian assistance – slightly more than $50 million was ever delivered, according to reports published by the Iranian government. 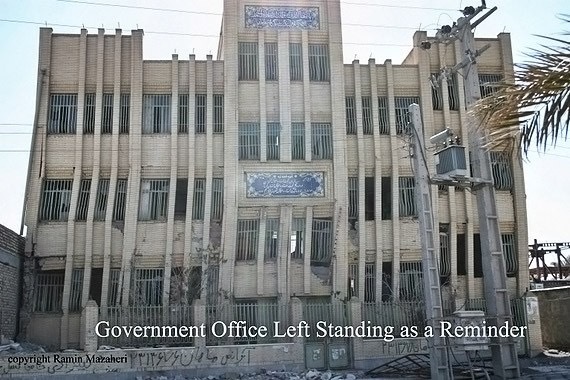 The reconstruction was left to the federal government and supported by committed humanitarian organizations such as The International Red Cross and Red Crescent, the United Nations (U.N.) and countless Iranian charities and aid workers. Just because it’s an Islamic government doesn’t mean it was bearded holy men in robes carrying clipboards in Bam. In this science-happy nation the staff was just your average, next-door engineer, like Majid Keshavarzmehr, 38, a flat-topped Iraq War veteran who brims with capability, competence and seriousness. As the Deputy of Reconstruction, Mr. Keshavarzmehr was stationed in Bam throughout the repair effort. As we toured the city and Citadel together I scarcely had recourse to my prepared questions as he ceaselessly spouted facts and anecdotes. In 2004 the World Bank anticipated that rebuilding Bam would cost $1 billion. According to reports published by the Ministry of Housing and Urban Development, nearly $1.5 billion has been spent in combined public and private funds, with the Iranian government shouldering about 85% of the total. 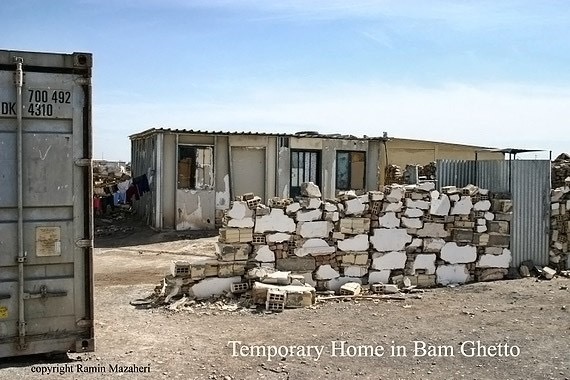 Many Iranians warned me that the money for Bam has been embezzled – that seems to be the ongoing assumption here – but touring Bam leaves no doubt that a great deal of money has been expended and value was realized. The reconstruction statistics are impressive: The number of schools more than doubled from 90 to 183. 50 new mosques have replaced the 100 that fell. 11 cultural centers have been built, along with six libraries and three universities – two public and one private. An enormous government worker complex, replete with fountain, wrought-iron gate and covered in Iran’s famed tile, is set to open this spring. Five new fire stations, new police headquarters, new courthouse, amusement park – in short, almost everything a city needs to function is present and brand-new. Everything the federal government constructed has been officially turned over to the city and the state of Kerman, according to Mr. Keshavarzmehr. 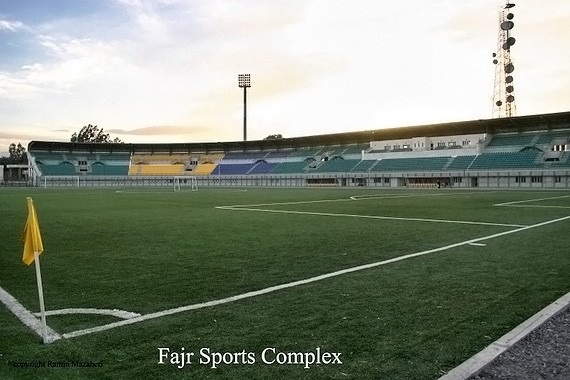 One of the first major structures to be completed, the Fajr Sports Complex was a joke here several years ago – you sleep in a trailer but you play soccer in luxury – but now the 6,000-seat soccer stadium and impressive facilities seem almost conventional. Abbas Jahanpour, manager of Hotel Azadi in Bam, knows as well as anyone the vital role the Citadel played in the economy of Bam. Five years into their 15-year refurbishment plan the government has budgeted only $10 million of the estimated $80 million required for renovation. According to Minister Saeedi-Kia, the government plans to increase the Citadel’s budget now that the area’s reconstruction nears completion. 50 people work in the Citadel on an average day, including roving teams of engineers and specialists from Japan, Italy and the U.N., but their task is epic. Standing amidst the scaffolding and heaps of broken bricks you see bits and pieces of what made the Citadel so astounding – an unbroken latticed terrace here, a refashioned rooftop there – but you didn’t have to tax your imagination when Arg-e-Bam stood in its glory. The Citadel has to be modernized to survive the next quake but without losing its nostalgic character. The ancient recipe for clay bricks is evident in pits all over the Citadel: take dirt, add water. Mix in some straw for good measure. But the new, hidden ingredient is carbon, which will strengthen the clay while maintaining that old-fashioned Achamaenid-era appeal. “The clay they are using is passing the laboratory tests,” confirmed Mr. Keshavarzmehr. The before and after pictures posted at the Citadel’s entrance makes one wonder if this mass of broken clay was really ever so intricately detailed. But the tourists will just have to wait – the citizens have to come first. Sparing no one, Bamis were torn apart by the quake, losing spouses, children, limbs or all of the above. But the quake left no shortage of people in the direst of straits. One example is a woman who asked not to be identified. 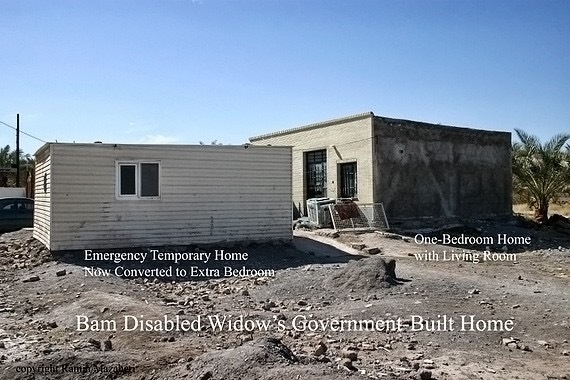 Her husband was killed and she became disabled as their house disintegrated on top of them. Her sister and brother-in-law also perished, leaving her to raise their two orphans along with the two now-fatherless children of her own. This new family of five moved from an emergency tent to a government-supplied 324 square-foot (36 square-meter) temporary trailer, which she now uses as a bedroom for two of the children. The government built her a one-bedroom, 720 square-foot brick home, common in the city. As government projects go, it’s adequate but new, and a far cry from being destitute. “Good health care for her and the children is available for them – this is Iran,” pointed out Ms. Mirzadei. The woman receives about $150 a month from a humanitarian organization and around $600 a year from the government. It’s not enough for a family to live well on in Iran, but it is a foundation perhaps strong enough for their lot to improve. While the government dealt with the majority of these hardship cases, charities have contributed more than $220 million to the reconstruction. 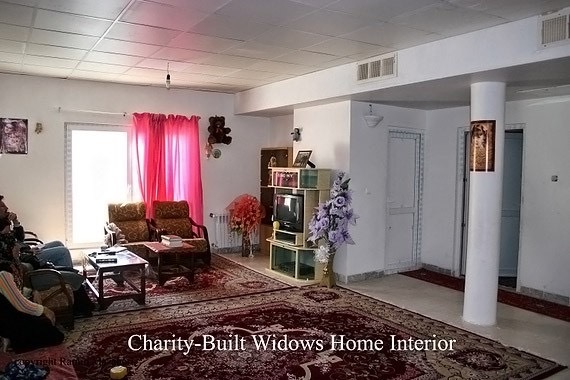 I visited an impressive widows home, wholly funded and supported by various Iranian aid organizations. Attractively built in a modern adobe style, the 30-unit complex has a 24-hour security guard, maintenance man on-site and a courtyard. Soghra Abadian has lived in the home with her three young children for more than a year. She invited me in and revealed a spacious two-bedroom townhouse with a large living room replete with carpets, as essential to Iranians as her tiled kitchen and bathroom. “Recovery from such a tragedy is never-ending,” she said. “So many widows like me are worse off economically because of the quake, but charities like these have helped tremendously,” said Ms. Abadian, who is scheduled to receive job training soon. Perhaps the most inspiring aspect of Bam’s rejuvenation is the dazzling new schools. Iran is a country with a daring visual sense and their architectural style is far more colorful, playful and innovative than what is generally found elsewhere. As such, nearly every school is distinct in appearance and gleams with promise, sometimes mystifyingly materializing from difficult to traverse side-streets or pockmarked lots. Keeping children cool in granite and marble, enclosed by new walls and gates; they can nearly be called palatial. If you believe what the residents tell you, apparently the only nice buildings in Bam prior to the quake were the Citadel and the centuries-old Main Mosque (Masjed Jame’a), which went unscathed. 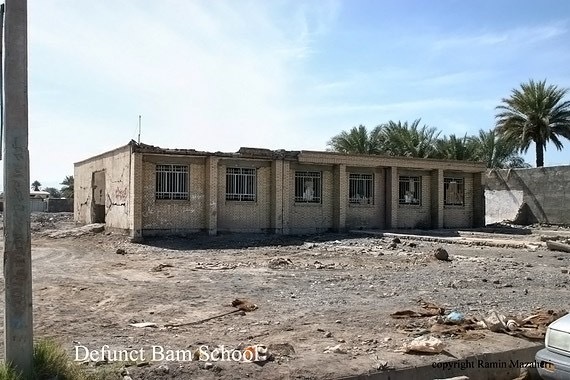 Examining the remains of an old school – cramped, barred, made of Iran’s common yellow “3 centimeter” brick – doesn’t do much to dissuade. 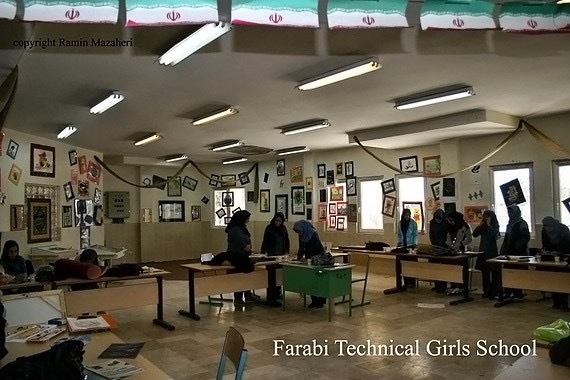 “The teachers in Bam don’t have any needs for more equipment or anything material,” she said. “We all feel that we have enough resources for the number of students we have.” She laughed with disbelief when I said these words may have never been spoken by American public school teachers. “After five years the children are coping well,” she added. The Iranian government, with much earthquake disaster experience, did not just throw money at homeless Bamis and let them figure it out. 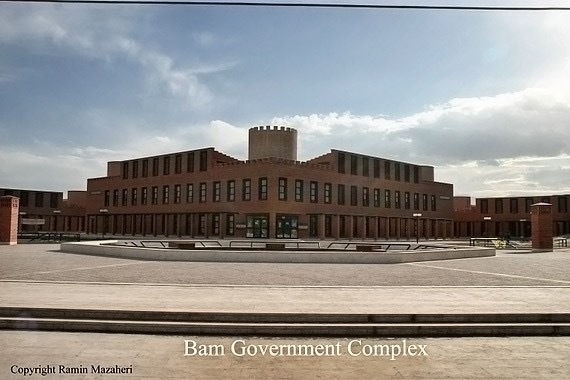 Instead, the government invited nearly 40 architects from Tehran to Bam and housed them in the newly created Technical Services and Materials Exhibition Complex. There, residents chose their own house design, faade and furnishings. Far from being a bleak city of row houses, the results are homes that are largely individual. “The negative psychological affect has been much less pronounced in Bam than in other Iranian disasters because the biggest issue we tried to resolve was getting the people as involved and as empowered as possible,” said Minister Saeedi-Kia. It’s a novel re-housing plan that has drawn inquiries from governments and organizations from Pakistan to China, according to Dr. Abolhassan Astaneh-Asl, professor of structural engineering at the University of California-Berkeley, principal investigator in the collapse of the World Trade Center and adviser in the reconstruction effort. Bam residents received from the federal government $5,000 outright in the form of a construction voucher, then $11,000 in low-interest loans. Mr. Keshavarzmehr estimated it cost $15,000 to build a one-story home several years ago but that figure approaches $25,000 today, due to rising worldwide construction costs. 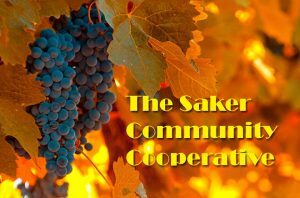 30,000 540-square-foot (60 square-meter) rural units were tackled first, to allow the farmers to maintain their fields and simpler to build than the urban units. “The rural houses are much better built than their old homes, much prettier and much, much safer,” said Mr. Keshavarzmehr. The rural reconstruction effort has been declared complete, according to Minister Saeedi-Kia. In Bam, the 20,000 homes destroyed by the quake have been replaced with 26,000 720 to 900 square feet (80 to 100 square meters) complete, modern, earthquake-resistant houses. According to Minister Saeedi-Kia, the majority of 6,000 incomplete homes belong to former renters who only recently secured government loans. These half-finished homes are a major source of dust and debris and lay bare the ongoing state of the reconstruction. 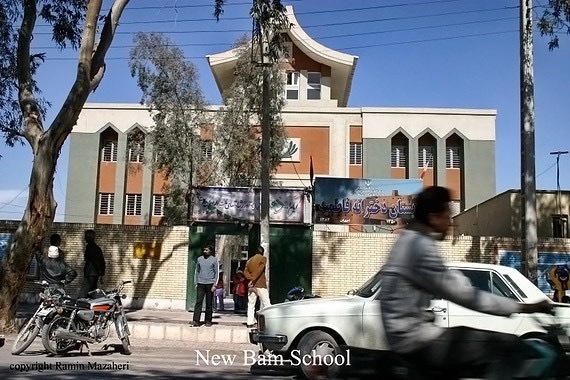 Area resident Daryoosh Khosravi said that most Bamis seem not to have been reduced in their economic station as a result of the quake. After a great deal of haggling, the only way business gets done in Iran, the city’s bazaar is set to open on March 21st, the Iranian New Year. Another architectural eye-opener, it is modeled not on the bazaar that fell but on the Citadel’s ancient bazaar. 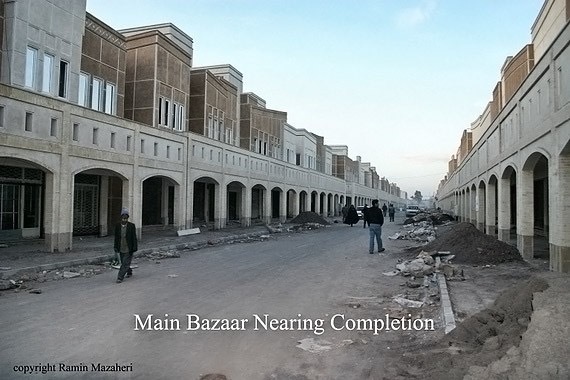 Bazaaris (Farsi for people who work in a bazaar) fought the new construction plan for years, even sleeping in their old stores so they couldn’t be demolished. The project didn’t get started until the government guaranteed every merchant a spot and issued low-interest loans to help finance the move. The area buzzes with activity as the bazaaris have taken over construction of their interiors, now that the government has completed the exterior. The government is halfway through constructing two additional commercial areas adjacent to the main bazaar. The three combined will house all 1,000 of Bam’s estimated businesses. 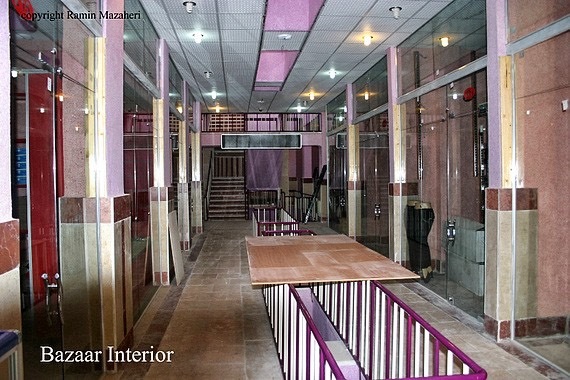 It’s a far cry from the makeshift bazaar that has been, as they say here, “made in China.” A city without a bazaar is inconceivable in Iran, so businesses improvised one out of whatever wasn’t in pieces. For five years stores have been operating out of the metal shipping crates usually found on railroads and ocean liners, often bearing the logos of Chinese companies, which were used to deliver the emergency aid. The last thing a dusty desert town needs is more dust, but a day outside in Bam leaves one coated in grime. The quake upended every paved road but the government has completed the major thoroughfares. Unfortunately, due to a lack of coordination between the Water Department, Light Department and the City, according to Mr. Keshavarzmehr, Bam’s side streets have yet to be cleared as some areas wait for updated water pipes and electrical lines to be laid. Water and power have been provided for free by the government since the earthquake, and blackouts are minimal, but these obstructed streets add greatly to the gritty atmosphere and their immediate repair was the most common request of area residents. They have already carted away over 15 million tons of debris. Mr. Keshavarzmehr came up with the idea to deposit the rubble in the form of two enormous mounds, by far the tallest structures in the region. 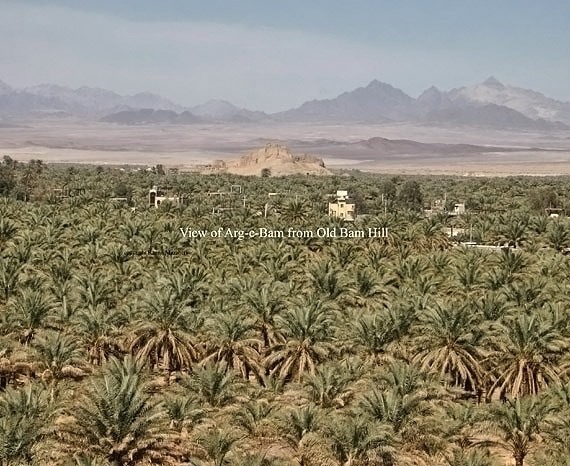 He hopes he can convince the city to grass it over and call it “Old Bam Park,” giving residents a breezy view of the city, the nearby mountains and the surrounding desert for dozens of miles. It also gives a stark view of Bam Cemetery (or Behesht-e-Zahra), which quarters 25,000 Bamis killed in the quake. Entire families are buried together en masse, sometimes six deep. 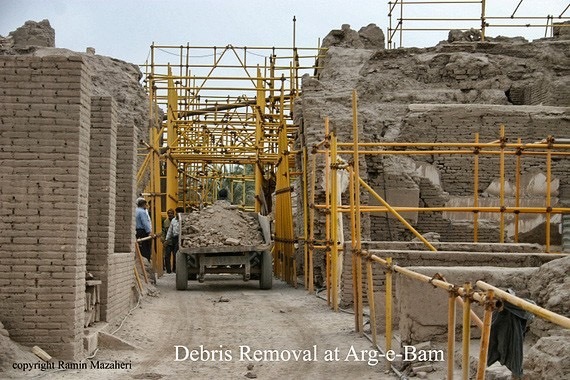 To preserve Bam’s dominant industry, date production, restoring the functioning of Iran’s ancient and extensive underground waterways (or qanats) was the first item on the government’s reconstruction list, but production is currently below pre-quake levels. 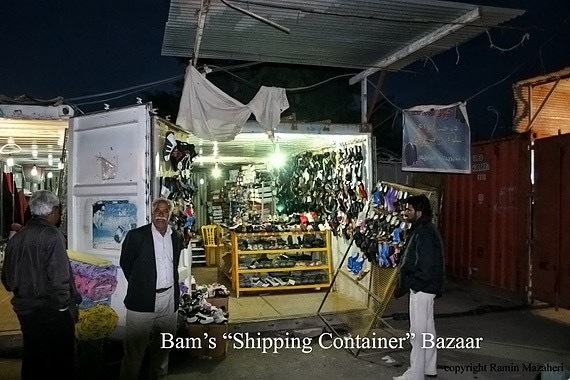 Bam has a reputation in Iran for being a tough town, probably a result of its location along a drug corridor that watches a tremendous amount of the world’s opium and heroin pass through from Afghanistan. Many area residents are reported to have turned to the cheap and plentiful drugs in their sorrow. “You find a higher proportion of female drug addicts here than usual,” noted Ms. Mirzadei, who believes grief over lost loved ones is the common cause. In the quake’s aftermath several thousand people from nearby rural areas flocked to Bam, squatted on land at the edge of town, built rudimentary homes and haven’t left. “It was always a bad area, full of drug addicts, but it really grew after the quake,” said Ms. Mirzadei, whose social work takes her often to the area. An estimated 5,000 people now live in this ghetto. Local resentment is widespread for these non-Bamis, who are viewed as carpetbaggers trying to leech off government aid. The area received the same excellent schools and clinics as the rest of the city but poverty is clearly endemic. Most in the neighborhood live in the temporary trailers that were part of the emergency aid. A few “tricked the government,” in the words of countless Bamis, and have built real homes. Hopefully they find it an improvement from the rural villages they reportedly left behind. More government aid for those in the ghetto is planned, but apparently not immediately. Back in Tehran, Iranians have had difficulty accepting that the government-led reconstruction is a budding success. Their knee-jerk reaction was, to a person, “It must have all been done by the charity organizations.” But the facts don’t bear that out. Everyone has their own opinions on the ideals of the Islamic government of Iran, but to properly judge the specific actions of a government requires an objective suspension of personal ideology. Everyone may also have different standards of what constitutes a “good reconstruction,” but a reasonable yardstick may be the most appropriate gauge, such as: “Have the essential components of every society been re-established, such as adequate housing, education, health care, employment opportunities, infrastructure, etc. ?” By that measure, in a few years Bam may qualify as a success. About the author: Ramin Mazaheri is an journalist based in Paris. Bias, like quality needs qualifiers with it. Close attention to truth, honesty etc is a bias! So often people automatically imagine bias means ‘bad’. It needs to be qualified. ‘A bias for balanced reporting’. Penchant, inclination, etc could be used with similar meaning. And Ramin, for me, your article is,… a good one! Hi Ramin, thank you for your wonderful report. I love the way you write and describe areas or situations that you experience. I read often about Iran, as much as I can find. I admire very much the country and the people of Iran. Such a wonderful and inspiring culture and your work and words help me to understand so much. I have never believed Iran is my enemy and I do not believe for a second what my country is telling me about Iran. I know they are lying and I know why. So thank you again, and may you always be blessed. Yes, I am American. Why did the government issue loans on interest to the residents and baazaris? Isn’t collecting interest on loaned money prohibited in Islam? I suppose that could be a bit confusing. I didn’t want to get into a whole explanation of Islamic finance when I wrote that article, but I will here. Firstly: Yes, Iranian gov’t loans have zero interest. Let’s turn to private Islamic finance: loans can even have negative interest, where only you pay back 95% or so, and then 5% is a “gift”. But then there are service fees…and these fees are how bankers are paid for their work and also make some profit (key word “some”). Of course, the idea of Islamic finance is to limit the advantage of those with money as much as possible; to totally prevent usury; and to force bankers to earn their profits almost exclusively via sound investments which actually turn a profit (crazy idea, eh?). I cannot say for 100% certain in every case in Bam, but I assume that those who secured 100% government loans got 0% interest, while those who got loans with private bank involvement essentially got government-backed 0% interest loans, because the government would certainly pay the private bank fees for earthquake victims as part of the relief effort. So the Iranian government is not, LOL, making interest-bearing loans! But they do allow private banking, and in times of crisis they do need to work with private banks to meet high and urgent demand, but they certainly do insist on following the dictates of Islamic finance. Thus, when we take into account the fees, these are what I termed “low interest” loans for my English-language audience. I can see how one might be confused, as Islam does not allow interest, but they are essentially “extremely low interest loans” (especially over a long term) when I translate how this the loans for Bamis works into a Western/non-Muslim/English mindset. What’s absolutely key to take away here is that these home loans are nothing like “everybody pays 1/3rd of their paycheck to a private bank for 30 years” as in the West: i.e. debt serfdom. What about the other banker monster? Are private banks permitted to loan backed by a small percentage of monies on deposit? Thank you Ramin for the simple explanation. So the low-interest loans are actually delivered by private bankers who don’t make profits from interest on the loaned money but by acting as middle men and taking their processing charges. No wonder the west hates Iran! They tend to take care of people and do things right! Ramin, you have done it again, in your special way. Proof positive of your honest and thorough reporting. 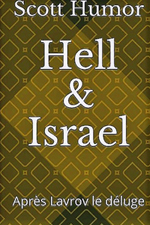 Iran, Russia and China build; The Anglo-American-ZIonist mob (Babylon the Great) only destroy. Heartening, really heartening. That’s how it’s done; that’s how it ought to be done! As a comparison, the last earthquake in Mexico. When help arrived from different countries it was very often held by authorities and eventually released to the needing as “help” from the ruling party (PRI) or simply stolen. My God! Wouldn’t this sort of societal attitude be a blessing for Syria…….after it has been cleansed of the US and Israel? Iran as the great nation that it is, must do more to better their image to the rest of the world. In a ziomedia cartel, showing Iran as a barbaric tyranny has worked, but that its so much far from the truth. 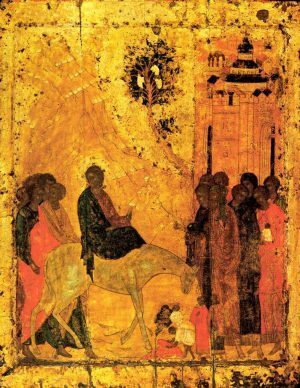 An excellent article. 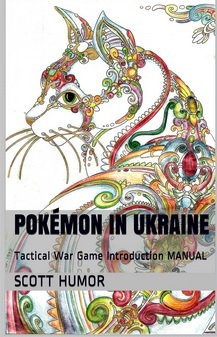 A pleasure to read. Except that the “ruling families prior to 1979” weren’t necessarily bunglers and slackers. They were simply self-serving Iranians running things according to the requirements of an American occupation = “Keep the people JUST below the restive level”. Give them enough of life’s three basic necessities to keep them in what Washington thought was sleeper mode. However, my trainees were wide awake and had the Revolution in motion months before my wife and I arrived. I was a technical instructor for the Oil Service Company of Iran (OSCO) and we lived in Kui Koroosh, in Ahvaz, Khuzestan throughout 1977 and 78. Ramin mentions Abolhassan Astaneh, a UC Berkeley professor of Iranian origin, in this article. Ramin mentions that he Abolhassan also studied the remains of the collapse of the World Trade centers on 911. It should be interesting to see his reports on that event. Basically, he concludes that the trade centers collapsed because of the heat given off on by the kerosene fires from the impacting airliners. He describes how the shock of the airplane impacts blew out the insulation materials designed to protect the steel from fire, resulting in the structural steel heating up above their limit (i.e. losing their temper) resulting in the collapse of the buildings. That is basic structural engineering principles. No need to cite thermite bombs to explain the collapse of those buildings. The wtc attacks have zero to do with earthquakes in Iran. Or Iran, period. RM writes a positive and informative article about Iranian earthquake disaster relief and recovery and this ts person attempts to turn the comment section into an off topic argument about a completely unrelated subject. This is a standard websayanim thread disruption technique I’ve observed hundreds of times. The goal being to stop positive discussion about a “verbotten” subject (in this case Iran) with an unrelated argument using a provocative “hook”. Not at all. Ramin has brought up a very interesting subject that I am ashamed to say I knew nothing about until now, i.e. the destruction of Bam in 2003 from an earthquake. Being someone who lives on top of the Hayward fault in California I have tried to stay attuned to possible seismic damage by keeping abreast of what is happening elsewhere. He cites this engineer who knows his stuff. I am impressed. Also this points out how the west ignores what is going on inside Iran, especially the good things they are doing. Dear Ramin, my deep condolences for the lost peoples and God blessing to all Iranians. 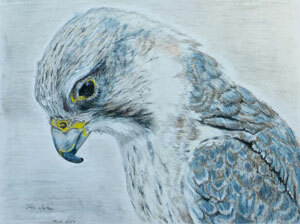 Thanks for the article and the pictures.